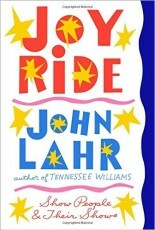 John Lahr spent 21 years as theater critic for The New Yorker, writing profiles and reviews, some of which are collected in Joy Ride, now out in trade paperback. which examines playwrights, directors and their shows. He is also the author of a recent biography of Tennessee Williams. The interview was recorded on Octonber 4, 2015, but the second half of the interview, concerning political theater, is even more revelant following the Trump election. Hosted by Richard Wolinsky. At the end of the program: She Loves Me, at San Francisco Playhouse, is reviewed. An extended 56 minute version of this interview can be found as a Radio Wolinsky podcast.